Eating well while you’re camping is essential, and for that, you need a good camping grill. A camping grill allows you to cook delicious food, without the hassle of a fire – which might not be allowed on some campgrounds, anyway. You can enjoy the pleasure of grilling just like you would at home, but with a much more portable piece of equipment. If you’re looking for the best camping grill for your purposes, there are several things you will want to consider. Firstly, a portable camping grill is extremely handy. A grill is never going to be as portable as a stove for backpacking use but you will be able to load it into your car or trailer. Once on site you’ll want to easily move it about. So weight is important, and you might consider looking for a grill with wheels. You might also be looking for a more compact grill so that it doesn’t take up too much space among the rest of your camping gear. Ideally, your camping grill would also be easy to use and, importantly, safe to use. You don’t want to spend hours trying to figure out how it works, and you definitely don’t want to hurt yourself. You’ll need to consider how much space you require to grill before making your purchase. This is important because you want to be able to cook enough food for everyone present in one sitting. Grill specifications should tell you how many burners there are, as well as the surface area size for grilling. This Coleman grill is a great option if you’re looking for a really portable grill that’s easy to move around. It’s a basic option compared to some other choices, but it’s suitable for anyone looking for something to fit in the trunk of their car. It measures 33.8 x 13.5 x 19.1 inches and folds up even smaller, but still offers a large cooking area. One of the best things about this grill is how portable it is. It has a collapsible stand and a low-profile lid, so it folds up small enough to fit into most cars. This is great if you want to save space or you only want to pack things into your car’s interior. It even has wheels and a towing handle, which double up as the stand when unfolded. All you need to do to unfold it is pull the handle up and lock the grill into place. It’s also very light at 35 pounds. Despite it’s small and portable size, there is still a fair amount of space for cooking and food preparation. Once you unfold the grill, there are two side tables underneath, which are excellent for holding your food before or after grilling. The grill itself is suitable for 3 or 4 people, with 20,000 BTUs of heat across 285 square inches of grilling space. It’s possible to switch out the top for griddle and stove grates, but these don’t come with the grill. This grill is available at a pretty reasonable price. However, as with any cheaper deal, you have to expect that you won’t always get the best quality. Overall, the Coleman Road Trip grill is pretty great, but there are a couple of quality issues. The question is whether you’re you’re prepared to put up with them for the price. One thing to note is that controlling the temperature on the grill can be a little tricky, making it hard to put it on low. Another thing that’s fairly noticeable is that the construction sometimes doesn’t seem to make sense. The grease tray isn’t in a great position to catch grease, for example. While the wheels and handle are sort of handy, the handle doesn’t lengthen so it doesn’t really work unless you bend down or you’re particularly short. Overall, the Coleman Road Trip grill is a great little grill for anyone who needs a compact and portable option. It’s a good choice for using while camping, and could also work well on a balcony, patio or small backyard. There are a couple of little niggles that could bother you, but they aren’t really big deals, especially for the price. The Blackstone Grills Tailgater is a grill that has several different combinations. This is great for anyone who enjoys cooking lots of different things while camping. The legs fold up, so it’s still a portable grill, although less so than the Coleman. It measures 52 x 24 x 38.5 inches, making it fairly large but that does get you 512 inches of cooking space. That’s almost double the Coleman grill. One of the best things about this grill is its versatility. It’s easy to switch it from using the grill box and griddle to having open burners for pots and pans. That makes it easy to cook whatever you want for breakfast, lunch and dinner. When you’re camping, you want to be able to cook for all meals. You can have just one open burner and use the grill/griddle with the other too. While this model might not be as compact as some other options, it means it has lots of space for cooking. 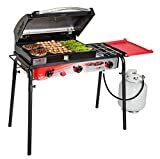 It features two burners, so you have more space to grill or griddle, or you can cook two things at the same time, using two different methods. The grill box will cook up to 500 degrees for super-powered grilling. The grill space measures 16 x 16 inches, which gives you 512 square inches to work with. That’s enough space to cook for a few people, although there are no side tables. 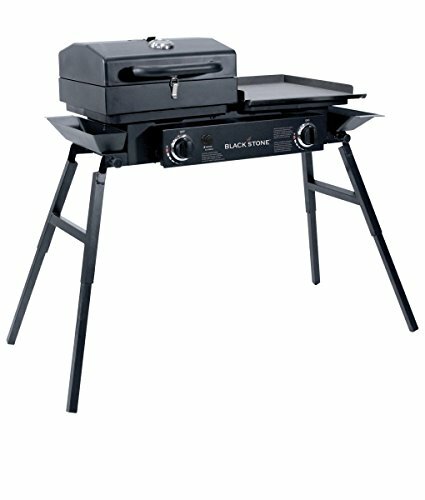 Even though Blackstone promises that this is a durable grill, there are some issues with it. They could be overlooked, especially for the price, but it depends how easily frustrated you are. 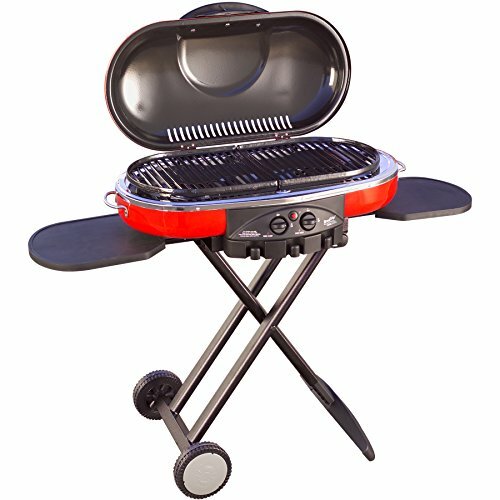 For example, the legs clip into place when the grill is standing, but not when they grill is folded down. This makes it trickier to transport. Another issue is that the clips to attach the grill box aren’t great quality. The Blackstone Grills Tailgater is a good choice for larger camping groups that need more space. It’s also excellent if you want to be able to cook in different ways and for every meal. Being able to put a pot or pan over the burners is extremely handy. However, having more space does mean that the grill is larger and a little less portable. Its portability isn’t helped by the legs not clipping in when folding, either. 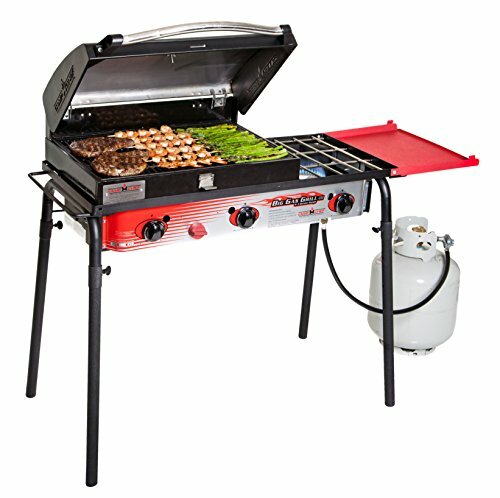 If you’re looking for an even large grill, the Camp Chef Big Gas has three burners which are each rated at 30,000 BTU. The cooking height is 30 inches, with a 608 square inch cooking space and 16 x 38-inch stove, and it weighs 75 pounds. This grill gives you more power and cooking space if you’re willing to pay for it. It’s a versatile grill, with removable legs, although it could be too big for some. Sometimes you need a really big grill for camping. You might be camping with the whole family or a big group of friends, and you need more space to cook up a proper feast. 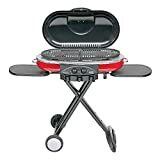 This Camp Chef grill definitely does the job, with a huge grilling area and three burners, as well as a folding side shelf. Despite its size, you can still count this as a portable grill. The legs detach, which is a little annoying if you prefer everything in one piece. However, you can buy a separate bag to carry it. Each of the three burners provides 30,000 BTU of heat, which is better than some other, similar options. This grill is versatile too, offering the ability to remove the grill box and replace it with any 16″ accessory from the same range. It’s easy to swap things around and configure it for the perfect setup. Unfortunately, this grill is a little difficult to maintain. It’s not the easiest to clean, and it’s possible that it might not last too long. The cast iron rusts fairly easily, which isn’t great when this model is more expensive than some other choices. However, with the right care, it could still last as it’s generally pretty durable. This large Camp Chef grill is fantastic if you want something bigger. It has a huge amount of space for both cooking and leaving food to stand. You can swap out the accessories to cook however you want too. Even though it’s not as portable as smaller grills, you can still pack it away, especially if you invest in a carry bag for it. Which is the Best Camping Grill Reviewed? If portability is what matters most to you in your camping grill, then the Coleman Road Trip Propane Portable Grill LXE is the best choice by far. It’s more compact and much lighter than the other options we’ve reviewed. It still has plenty of power, and there’s enough space to grill for three or four people. However, if you’re more concerned about having plenty of space and flexibility, the Camp Chef model is a good option and gets the runner-up spot. It might be much heavier and more cumbersome, but if you’re camping out of your car or RV, the portability might not matter to you too much.